Life has an indefinite value so that the money. We always hunt for an inexpensive life insurance policy that will protect our family financially. Term Insurance is a type of life insurance in which the life insured gets financial cover for a definite period of time. In the event of unfortunate demise of the policyholder within the policy term, the beneficiary or the nominees declared by the policyholder can claim death benefits from the respective insurance provider. The moment a newborn arrives, it becomes the most significant moment of your life. As the child grows up, the expenses also rise simultaneously. In this instance, the most important thing you think of is your child’s financial safety. This article talks about why all parents must buy Term Insurance Policy to ensure their kid’s safety. A newborn comes along with the responsibility. Welcoming the new member in your family, you start identifying the various goals that you want to achieve for your heir. Even, the remaining goals come later, first comes your child’s financial safety. A Term Insurance policy provides life protection in such a way that you get your life covered with lower premiums and greater coverage. Here, the mention of lower premiums is all about the amount in your hand, is more to take care of current needs of your beloved child. Buying an Online Term Insurance Policy gives you much more relief and makes it easy to achieve goals. Being a parent, you must fulfil your child’s needs until he turns mature and becomes independent. One of the most important things that you aim to provide your child is the quality education. From his schooling to higher education, there are several milestones that your child has to pass, and at every milestone, he’ll need a corpus. Bearing in mind the bad fortune, have you ever thought of if you are not there? The simple answer to this question is you should opt for an Online Term Insurance. Consider an incident where you have a newborn baby, and you decide to purchase a new house on loan. But, misfortune doesn’t come with the prior hint. Think a bit about your family, especially about your child, if any unfortunate event occurs, who will take care of his financial needs? On the other hand, you’ll forcefully delegate your liability to him. In such incidences, why should your child bear the liabilities you had in your life? 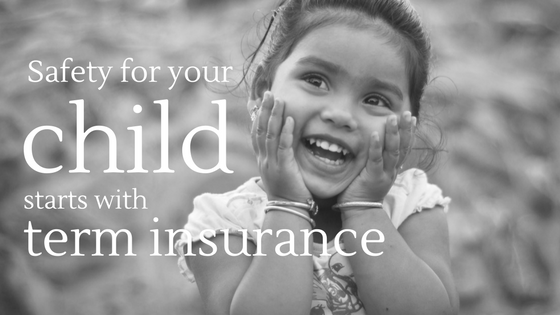 Here, Term Insurance would stand a better option for both you and your child. As the plan offers great death benefits, your family and all together your child would get some relief from the liabilities. Eventually, every parent needs to have an adequate life coverage so that his child wouldn’t suffer from any financial disaster. Stepping ahead, a goal-based life insurance will surely help you in any contingency and your family would be able to maintain the same standard of living even in your absence. A Term Insurance sets to be a perfect goal-based life insurance, as it fulfills the unsaid rule of having multiples of your annual income as the life cover. If needed, you can segregate the different goals as per your requirements and choose the different Online Term Insurance Plans to meet each goal separately. In such ways, you can ensure your child’s financial safety with the help of Term Insurance Policy.